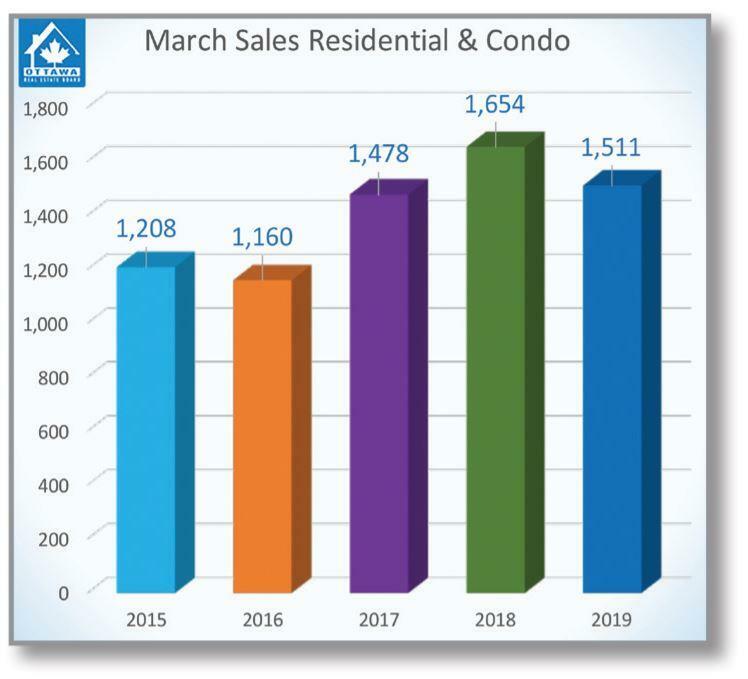 OTTAWA, April 3, 2019 - Members of the Ottawa Real Estate Board sold 1,511 residential properties in March through the Board’s Multiple Listing Service® System, compared with 1,654 in March 2018, a decrease of 8.6 per cent. March’s sales included 1,136 in the residential property class, a drop of 12.4 per cent from a year ago, and 375 in the condominium property class, an increase of 5 per cent from March 2018. The five-year average for March unit sales is 1,402. "In Ottawa, we have a population base that’s increasing year over year with a growth rate of 8.8 percent, which is higher than Ontario (5.7%) and Canada as a whole (5.9%). Immigration and high employment levels are bringing residents to our desirable and affordable city,” he suggests. “The condo units in the entry-level range are near depletion as first-time homebuyers are trying to get into the market at the lowest possible price. Moreover, previous renters may have been pushed into condo ownership with rental vacancy rates in Ottawa at less than 1%. If there were concrete incentives for investors to purchase properties to lease or develop purpose-built rentals - it could certainly stimulate the rental market,” Delahunt concludes.